This post is a revised and modified English version of my guest post at the blog of the Digital National Library of Poland POLONA which was published on October 17, 2013. Stanisław Lubieniecki’s Theatrum cometicum as a physical book is such a marvellous object that I should recommend all readers of this post to immediately locate the nearest copy, turn off the computers, go and see and feel it on your own. Theatrum, published in three parts is one of these pieces of early modern scholarship which can serve as a material proof of the great falsehood that stands behind the digital libraries, regardless of their size, scope and democratic character, starting from the private, corporate enterprises through the digitization projects carried out by the national libraries, to the digital repositories of academic, regional or even municipal libraries. There is no digital image, no file format that could either render or substitute the experience of having Theatrum at one’s desk in the special collections reading room. Furthermore, Theatrum’s three parts were bound quite often in one monstruous volume of about 1,5 thousand folio pages which, together with the weight of historical wooden and leather bindings, gives a massive brick that requires quite a lot of physical strength from both the librarians and researchers. But let’s leave the discussion of digital vs analogue for another occasion and focus on the very work of the Socinian astronomer. The content of Theatrum is a subject that would require a separate study, perhaps even a book, which, to my amazement, have not been written thus far. The only longer monographs on Lubieniecki are K. E. Jordt-Jörgensen’s study of his theological views and Janusz Tazbir’s monograph which covers Lubieniecki’s biography and gives some general overview of his achievements in various fields, including his research on comets. The rest of information on Lubieniecki is scattered throughout academic journals, basically in articles and, at times, in brief reports on newly found manuscripts of his letters. The fact that both books on Lubieniecki have been published in the 1960’s and Tazbir’s study, which was actually his PhD dissertation, was republished in a slightly revised form in 2003, justify the claim that this early modern figure still awaits a scholar who, equipped with new research tools and awareness of new discoveries in early modern intellectual history, would encompass Lubieniecki’s scholarly workshop, link his theological inquiries with astronomical observations, reconstruct his theological position in the light of new scholarship on history of Socinian theology, have a look at his achievements in the field of historiography, perhaps shed some new light on the winding routes of his biography and, what seems to me the most important task that needs to be done with regard to this eminent figure, analyze his network of correspondents. As for the Theatrum itself, suffice to say that the work’s main goal seems twofold: (1) to provide a catalogue of all comets that have been mentioned in historical records that were available in the mid-seventeenth century and which appeared on the firmament in the period between the biblical flood and the year 1665 C.E. and (2) to create a detailed documentation of comets that could be observed in Lubieniecki’s times. This was quite an ambitious enterprise, which perhaps exceeded the abilities of one, even the most talented and skilful scholar, and due to this fact Lubieniecki engaged a whole army of fellow scholars, whose names appear in front of us while we are leafing through the 1,500 pages of Theatrum. The volume as such, and its first part in particular, makes a gigantic research report on all matters related to comets that Lubieniecki found in received letters. In order to create a credible work that would be based on facts and observations, the Socinian astronomer created a whole network of correspondents which included such eminent figures of early modern European science as Henry Oldenburg of the Royal Society in London, Athanasius Kircher, the brilliant (and controversial) Jesuit inventor and scholar, and Johannes Hevelius, the famous Gdańsk astronomer, who gained renown thanks to his observations of the Moon and who published his own Cometography several years before Lubieniecki. Yet the exchange of letters and reports reprinted in the volume constitutes only one part of the whole text of Theatrum and at the same time these letters cover only a certain part of Lubieniecki’s correspondence − some of his letters were not included in the volume, yet they shed some light on both his biography and scholarly workshop. Analysis of these epistles and reports allows one also to look at one of the corners of the great lost continent of early modern res publica litteraria, which is currently restored to life by a growing number of projects. Taken as a whole, the first part of Theatrum makes a mozaic of multinational and interconfessional republic of learned men who stayed in touch despite the experience of a great political and religious divide which ran through the entire seventeenth-century Europe. Paradoxically enough, Lubieniecki as a member of the heterodox Unitarian community of Polish Brethren, which was despised by theologians of all Christian denominations, managed to gather under one roof Jesuits and Protestant scholars for the sake of one common scholarly goal. Did Lubieniecki manage to succeed? The answer is ambivalent. On the one hand, he managed to collect an enormous amount of data which he incorporated into one, quite well organized conceptual structure. From this point of view Theatrum is an impressive piece of scholarly work and meets the expectations of a virtual early modern reader, especially with regard to the descriptions of the seventeenth-century comets. Through the first part of Lubieniecki’s work we can peek at early modern research procedures and protocols of remote collaboration between a number of astronomers. On the other hand, Theatrum is a broken work, a testimony of a desperate attempt to reconcile and combine in one work a series of various intellectual ambitions and at the same time a monument of the erudite, omnivorous, encyclopaedic spirit of the age. The reason for this is the fact that the pars posterior of Theatrum is not only a methodical attempt at reconstructing all occurences of frozen blocks of cosmic ice on the firmament but it is also a record of yet another, parallel enterprise. The other goal that Lubieniecki had in mind was to synchronize two separate orders of events or phenomena: the astronomical one, with comets and their interplanetary or even interstellar travels, and the earthly one which consisted of the events that sum up into the history of mankind. Apart from being astronomer, Lubieniecki was also a historian, an author of equally monumental History of Polish Reformation (Historia Reformationis Polonicae, published posthumously in Freistadt in 1685). These two professions of Lubieniecki’s met in the pages of Theatrum. On the one hand, he intended to create a purely astronomical work that would meet the expectations of the growing scientific community, while on the other hand he could not resist the temptation to make use of his astronomical knowledge in the field of historiography. On the title page of the whole work he announced that Theatrum, among many other things, is also a work on chronology and what its pars posterior became in the end is indeed a kind of a crypto-chronological treatise that could be put on the shelf with works by Joseph Justus Scaliger, Gilbert Génébrard or Sethus Calvisius. Although he put chronology in a series of other epithets describing his enterprise, I believe it is exactly this term which describes the best what he − willingly or not – actually achieved in the second part of Theatrum. Chronology, a meticulous study of ancient and modern calendrical systems and their comparative analysis seems nowadays quite an obscure or even obsolete discipline, but back in the sixteenth and seventeenth century it was giving a serious headache to a vast number of scholars. As such it still awaits a thorough narrative that would embrace together the eminent figures of the intellectual firmament and a bit more provincial scholars who on their own tried to tackle such problems as the proper dating of the biblical flood or of Christ’s nativity and death. As a systematic method of “cartography of time” (to borrow the phrase coined by Daniel Rosenberg and Anthony Grafton in their marvellous study) chronology meets yet another type of scholarly, or even cultural activity. I believe that in certain parts of Lubieniecki’s work an attempt at sketching the detailed map of time was combined with the scientific visual culture, in particular with what Jerzy Dobrzycki and Jarosław Włodarczyk named once a “natural history of constellations”. It is the 84 figures which accompany the text of Theatrum cometicum that deserve also further scholarly attention as Lubieniecki’s work is not only a great emanation of a Baroque mind with all its twists and inclinations but also an attempt to give a suggestive (and visually appealing) representation of data collected in the volume. Between the pages of Theatrum we will find folded charts that contain drawings representing the trajectories of selected comets. 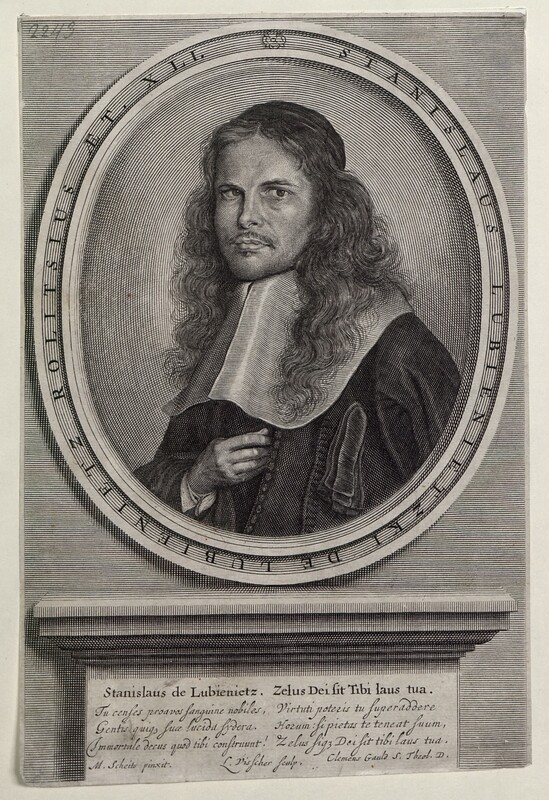 Lubieniecki published his opus magnum in Amsterdam, being already a political and religious émigré who was forced to leave Poland on the strength of the resolution of the diet of 1658. His publisher, Franciscus Cuperus, has taken care of fine contractors. The engravings are stylistically varied and they oscillate between the richness of elements which leads almost to illegibility (G. Gerardi) and the delicate, contour stroke which at times resembles drawings by the members of the Art Nouveau movement (Gerritsz). In each drawing one can find a visual representation of the trajectory of either historical or contemporary comet. The reader’s eye has to get accustomed to the mass of elements before it begins to distinguish between the allegorical depictions of constellations (hence the “natural history” phrase) and quite a large amount of astronomical data such as the brightness and magnitude of stars or the route of the ecliptic. The graphic layer of Theatrum is up to a point a place where all intentions of Lubieniecki meet. Suffice to have a look at a plate between pages 38 and 39 of pars posterior. The reader’s eye gradually notices successive elements of the surrealist collection that consists of a sailing ship, a cross, a chameleon, a lion, a bear and an upside-down Pegasus. The meticulously accumulated stars of various brightness and magnitude do not make this task easier. When the reader starts to think that she finally knows what this is all about, she notices several dozen comets entangled between the stars that bear the dates of their appearance on their tails. All comets depicted in this plate occurred in our era (hence the “A.C.” by each date = “Annum Christi”). What could be the purpose of such a drawing (provided it is not only a showoff of the imagination and artistry of the graphic designer and engraver)? Due to the chronological current that runs through the whole of Lubieniecki’s work the answer is quite obvious yet at the same time astonishing. What we have in front of us is an elaborate, complex and artistic variant of a good old timeline. What then was a “general history of comets” became a joint “general history” of comets and men. If we assume that comets epitomize the whole spectrum of astronomical phenomena, then we can say that we are dealing here with is a general history of everything. It is finally worth noting that this could be perhaps one of the most extravagant of early modern timelines. If we assume for a while that the synchronization of two spheres, two orders, the heavenly and the terrestrial one was one of the main purposes of Lubieniecki, then what else could be said of a representation of history which requires connecting the dots which eventually give a huge knot which is nearly impossible to be untangled? Lubieniecki lived in times when the belief in magical influence of comets was becoming more and more obsolete. The age of discussions which engaged his fellow-believer, Andreas Dudithius, started to fall slowly into oblivion. Nevertheless, Lubieniecki deciding to leave one comprehensive view of the world immediately entered another one; he rejected the assumption that phenomena from one sphere shape the things in the other, but instead he gave oneself over to the idea of mutual explanation of these two spheres. His Theatrum is a fascinating record (or even a monument) of these intellectual efforts. 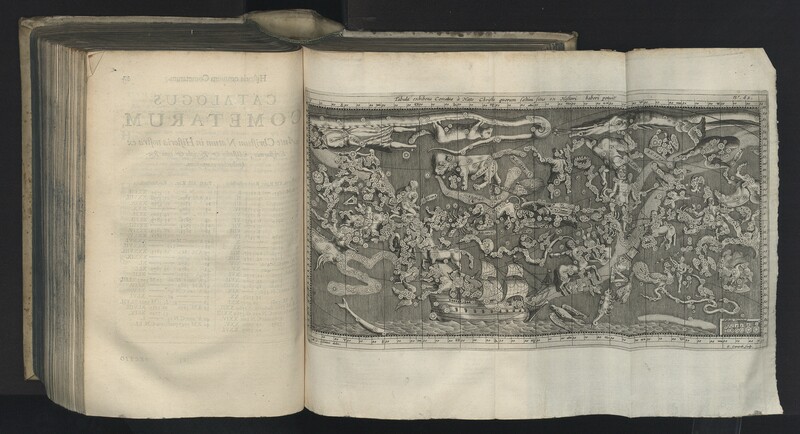 All images in this post from: S. Lubieniecki, Theatrum cometicum, Amsterdam 1668; National Library, Warsaw, shelfmark BN.XVII.4.2660, digitized by Polish Digital Library POLONA.